We’re only three months into 2017, and the heavy-hitters just keep on coming. We’ve had quirky sequels in the vein of Gravity Rush 2 and Horizon Zero Dawn, a wildly ambitious franchise-starter from a studio that spent more than a decade largely confined to corridor shooters. Turns out there really was light at the end of the tunnel — a radiant light that illuminated Aloy and a post-post-apocalyptic RPG that is arguably PlayStation 4’s greatest exclusive yet. But if Horizon stands as March’s first tentpole release — for those in Europe and other PAL regions, at least — then the industry’s attention will soon be drawn toward NieR: Automata and Ghost Recon Wildlands. We’ve already recapped Everything You Need to Know about the former RPG, so let’s shift the spotlight over to Ubisoft’s tactical shooter. Held up as the publisher’s biggest open world title to date, Wildlands is situated in South America — Bolivia, to be specific, where an elite team of Ghosts are ordered behind enemy lines to shatter the alliance between the cartel and a government that’s fallen prey to corruption. So, you’re ready to venture out onto the open plains of Bolivia? Not so fast! 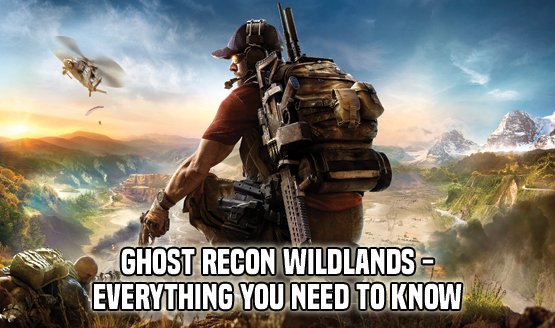 In anticipation of its worldwide launch on March 7, we’ve scoured the four corners of the internet — and the PSLS archives — to compile all the necessary information you could ever need pertaining to Ghost Recon Wildlands. Tom Clancy’s Ghost Recon Wildlands will deploy for duty on PS4, Xbox One and PC on March 7. Now that you’ve got the inside scoop on Ubisoft’s open world shooter, tell us, do you plan on picking up Wildlands at launch? Or do you have your hands full with Horizon and/or Zelda? Do let us know.